*** PAY FOR TWO NIGHTS GET THE THIRD NIGHT FREE! I restored the ruins of the church over a 3 year period. I’m a builder and I love old buildings. My 2 girls my brother and all my tradie mates helped me restore the church. I live at the 1836 Settlers Arms Inn at St Albans with my wife and new son Freddy. Come and stay at the church and come up for lunch or a drink at the pub. This is one of the most unique buildings you’ll ever stay in It is the largest sandstone structure built outside the Sydney basin in the 1830s. It is the oldest Catholic Church on mainland Australia and it has a very unique history and is very comfortable for 10 guests to stay. The church and its surrounding district of Wisemans Ferry and St Albans is very historic to early settlement there are some great tracks to go on bushwalks. The church offers great privacy as it is set on 5 acres of grass and bushland. Yet it is only 90 minutes from the CBD of Sydney. Check out our YouTube videos for further information. The church is set on 5 acres overlooking the Macdonald River. It is about a 5 minute drive to The Settlers Arms Inn a beautiful 1836 sandstone pub on 2 acres with chooks & peacocks wandering around. Just 6 minutes down the St Albans Road you come to the historic village of St Albans. Have a meal and refreshments at The Settlers Arms Inn. Go for a walk around the village it’s park or have a swim. There are glimpses of the Macdonald River from the bedroom windows in the church. The church is set above the Macdonald River, St Albansm there are some sandy beaches along the river bank. Nice for bass fishing. A swim or just relax on the sand. There is a golf course at Wisemans Ferry. Also the Riverside Oaks international golf course is at Catti about 45minutes from the church. The church is in the Macdonald Valley with soaring sandstone escarpments lining the valley. Fantastic, comfortable, everything provided for maximum comfort and enjoyment. We stayed for an end of year staff party/get together and we were blown away by the beauty and uniqueness of the place. It was a huge property with so many nooks, crannies and relics to explore. Everything was neat and readily available and our host was welcoming and helpful. We would stay again in a heartbeat! Staying in St Joseph’s guest house was an experience in itself. It’s an absolutely stunning property with plenty of living spaces, well equipped kitchen and refreshing swimming pool. The bedrooms were clean and beds were super comfortable with good quality linen. Each bedroom has on suite which made it easy for our group of 10. The house is located in a very quiet area, away from the road and any noises, which makes it a perfect hide away location for getting away from the city and busy lifestyle. We had no phone reception and no internet, which was a perfect for getting lost in a book or enjoying hours of dinning with a group of friends. The grounds are well kept and our Labrador loved running in and out and around of the house. The owner was communicative even on Christmas Day. I recommend St Joseph’ guest house for those who want to get away from the busyness of everyday life and spend quality time enjoying company of friends and family. Thanks Monika for your review we aim to please all our guests. Even though it was hot I’m sure the pool and the air conditioners helped your stay to be as enjoyable as it sounds. Hopefully next time see you down at the Settlers Arms Inn where there is a band playing on Sundays where your Labrador is welcome there on a lead. There are chooks and peacocks to admire and a tractor for the kids to play on. We booked the guesthouse for our wedding. Upon arrival we discovered the house was very dirty, kitchen equipment was greasy and very unhygienic, several light bulbs not working. We contacted the owner to let him now it needed to be properly cleaned for our wedding. The owner promised to send a cleaner who never arrived and we had to clean the entire house ourselves. Very disappointing and such a shame the management is poor as it is a beautiful place. Thoroughly enjoyed our stay at this venue and was an optimum place for our wedding celebrations. The photographs should speak for themselves, but this place lives up to the expectation. The spaces are vast and well appointed and the location is beautiful. You will not be disappointed. Our stay at St Joseph's Guest House was an absolute pleasure. The church has everything you could think of for a relaxing and elegant 5 star getaway. We enjoyed all this property has to offer. The kitchen is wonderful to entertain in, hosting all the mod cons. We enjoyed sitting out on the private back deck, overlooking the grounds and pool. We really enjoyed looking around the property that holds a lot of history for the area. Steve the owner is an amazing host and has done an outstanding job on bringing back to life this grand old building. I would totally recommend to grab a few friends and book out the entire place for a weekend or even longer. Thank you from all the girls, we really enjoyed our weekend getaway. The church is 90 minutes from the CBD of Sydney but a world away no toll roads a beautiful ferry ride across the scenic Hawkesbury River. Great for Summer getaway with the Church air conditioning and the plunge pool what a great way to spend the weekend with 10 of your friends. Winter is a fantastic time at the church perfect for Xmas in July or come down to the Settlers Arms Inn where the have good cheer good food and 1 or 2 of the 5 fires 🔥 going for your comfort. The St Joseph’s Guesthouse is such a unique experience. 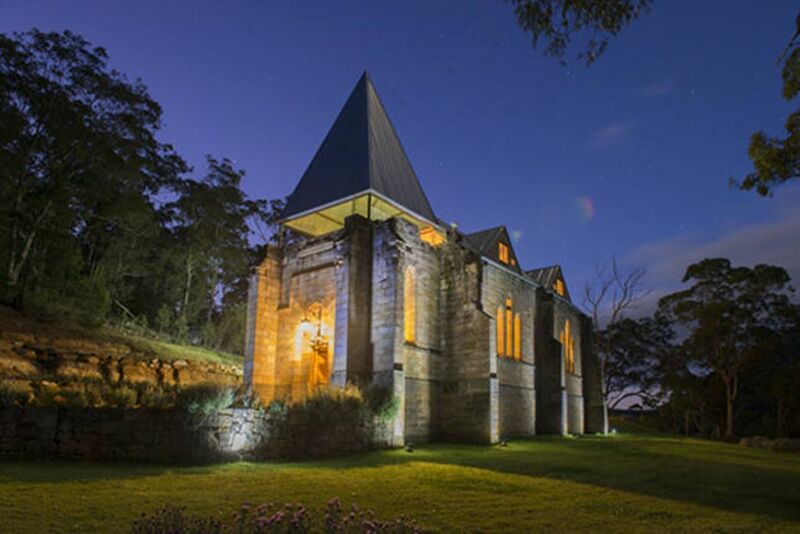 Where else can you stay in a 180 year old sandstone church with 10 friends.